1845 - Patricio Milmo O’ Dowd left Ireland to come to America in pursuit of fortune. 1848 - He established the first banking agency in the north of Mexico under the name Casa Milmo with branch offices in Matamoros, Eagle Pass, Laredo, Texas and later Torreon. 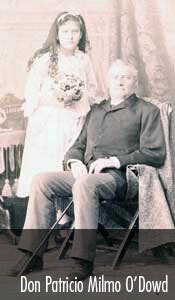 1861 - Patricio Milmo married Miss Pudenciana Vidaurri daughter of General Santiago Vidaurri and Dona Juana Vidaurri, descendants of Vasquez Borrego, one of the founders of Laredo, Texas. in the National Railway to transport his coal and became “coal partner” in La fundador steel company. 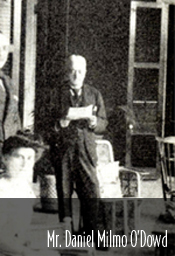 1863 - Patricio Milmo opened the Milmo Bank of Monterrey in Monterrey, Mexico. 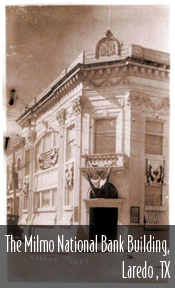 1882 - Patricio Milmo and Daniel Milmo purchased the land for the establishment of a new bank, “Milmo National Bank of Laredo”, and received the federal bank charter from the US government in July of same year.